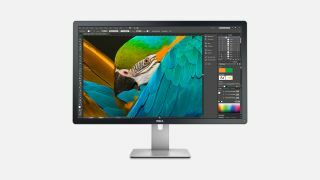 Whether you're looking for the best 4K monitor for creative work or a spot of gaming, we've got you covered. Looking for the best 4K monitor you can afford? You’re in the right place. With the prevalence of 4K video in camera phones, 4K gaming, and a slow trickle of 4K movies onto Netflix and the iTunes Store, this incredibly high resolution is now becoming commonplace. There’s a lot of choice out there, but whether you’re looking for the best curved or ultra wide 4K monitor, a 4K display for gaming or design, or just a stunning 4K display for your home, we’ve got you covered here. It helps that 4K displays have dropped in price considerably. In high street stores, you can find 4K TVs for around the same price that a standard HD screen cost only a few years ago. And for PCs, 4K displays are cheaper than ever. We’ve found the best cheap 4K monitor deals elsewhere, if you’re looking for a great 4K screen that won’t break the bank. So what’s the best 4K monitor right now? If you remove price from the equation, it's the Eizo ColorEdge CG319X, thanks to its outstanding colour accuracy and built-in hardware calibration tool. However, our top recommendation is the Dell UltraSharp U3219Q, which is an excellent 4K monitor – and a little easier on your wallet. But when you first gaze at one of these screens, you’ll know where that extra money went. There’s a visible improvement in colour quality, black levels and brightness with a high-end display, which makes them absolutely superb for working with images or video, and many for gaming too. Read on for our recommendations for the best 4K monitors out there. Dell has a long history of offering high quality displays, and each year its newest models raise the bar for image quality and features. The Dell UltraSharp U3219Q is the company's 2019 flagship 4K 32-inch screen – and we love it. It offers full sRGB and Rec. 709 coverage, with 95% DCI-P3 and great colour uniformity, making it a great choice for pro designers and creatives. Best of all, it isn’t quite the wallet buster that some high-end screens are. Although it lacks the built-in colour calibrator you get with some screens – like the eye-wateringly expensive Eizo ColorEdge CG319X below – the U3219Q's overall build is extremely high quality, with a modern design, matt IPS panel finish, 6mm thin bezels and USB-C. If you need pro features, superb colour accuracy and don't have a spare four grand, this is the best 4K monitor you can buy right now. The BenQ PD3200U's screen size and resolution make it a great choice for designers and creators. It isn't the cheapest model in our guide (for that, scroll down to the Iiyama at number 07) but it's a more affordable option for pro creatives than the other options so far. So what's so good about it? Well, the screen is a hefty 32-inches, which makes working with 4K images and videos much more comfortable. 3D designers will be grateful for the inclusion of a CAD/CAM mode, and everyone else will appreciate the factory-calibrated colour accuracy and Rec. 709 adherence. The Philips Brilliance BDM4065UC is an incredible display – but do you really want a 40-inch panel? Based on VA-IPS panel technology, it offers extremely good contrast, with 300 cd/m2 brightness. Its menu is controlled with a small joystick at the back and it also offers a four-way picture-in-picture (PIP) mode, allowing you to allocate a quarter of the screen to each video input. On such a large 4K screen, each connected device will have its own 1920 x 1080 screen area – perfect for seeing your designs in Illustrator CC or working on your 3D art on one machine while looking up reference images on another device on the same screen, for example. Whenever Lenovo launches a Think-branded product, you can expect high quality, which is exactly what you get from its designer-focused ThinkVision display. An excellent design, plenty of ports and great picture quality make the premium Lenovo ThinkVision P32U worth its high asking price. 100% AdobeRGB coverage is enough to compete with top-end screens, and it has Thunderbolt 3, which lets you connect and charge laptops from a single port. This professional-grade 4K monitor isn't cheap, but it certainly is impressive. Asus has updated its flagship ProArt 4K display, the ProArt PA32UC-K, with a more premium appearance, 10-bit colour, a whole new set of inputs (including Thunderbolt 3), much higher 1000-nit brightness and even better accuracy, now using a 14-bit look-up table (LUT). Hardware support for colour calibrators is now included out of the box and accuracy can hit 100% sRGB, 99.5% Adobe RGB, 95% DCI-P3 and 85% Rec.20. All very impressive, but it comes at a high price. That said, with a feature list and image quality that now puts it up there with the most high-end screens The PA32UC-4K is more competitively priced than first appears. This is one of the best 4K monitors you can buy. Iiyama's 28-inch B2888UHSU is a lot more reasonably priced than many of the options we've presented in this buying guide. It uses a TN panel with a 1ms response time, and although the viewing angles aren't quite as wide as you'll find with an IPS display, there are plenty of small extras that make the B2888UHSU a really good buy. It has plenty of inputs, too, plus a fully adjustable stand, and a picture-in-picture mode, so you can use two devices simultaneously with this monitor. The U28E590D is a slick 28-inch 4K monitor with a beautiful design and a whopping 8.3 billion pixels. DisplayPort 1.2 gives you fluid 60Hz 4K, while everything is detailed and clear thanks to a brightness of 370cd/m. Picture settings can be tweaked using the on-screen menu, or you can sit back and enable its Dynamic Contrast mode to do the heavy lifting. There's also very smart port placement, so you won't have to bend around the back to connect any cables or peripherals. 4K, also known as Ultra HD, refers to the high-definition resolution 3840 x 2160 pixels, which is four times the 1920 x 1080 pixels found in a full HD TV. Those extra pixels are particularly appealing for creatives and gamers who want the best colour accuracy and detail from their displays.